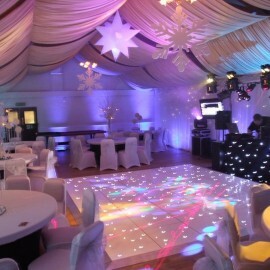 No event is complete without you and all your guests getting up at the end of the night and dancing to some great music. 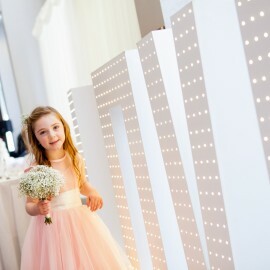 Providing a fun area where you can dance with your friends and family, our dance floors are a must-have addition to any event. Whether you are hosting a wedding, party or corporate event, dance floor hire for Liverpool is something you should seriously consider including for your evening. 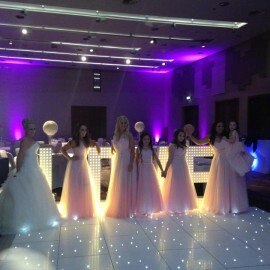 White LED Dance Floor including delivery and set up. Marcus Routledge - Managing Director. 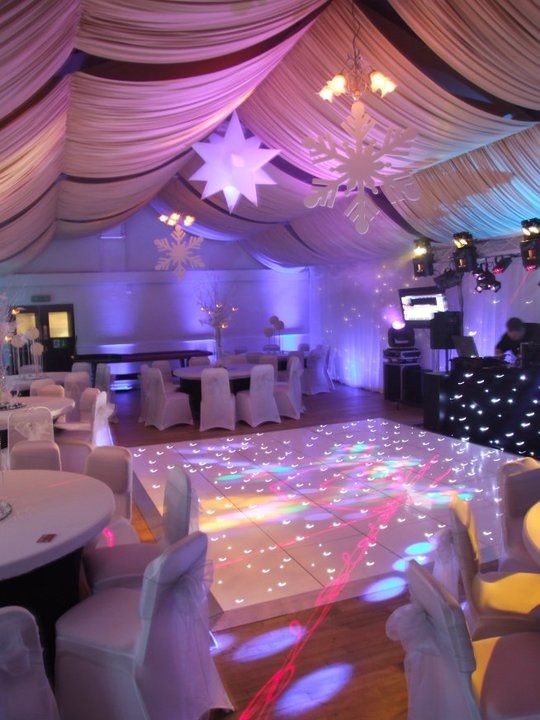 Marcus has had over 20 experience as an entertainer working overseas and across Europe. 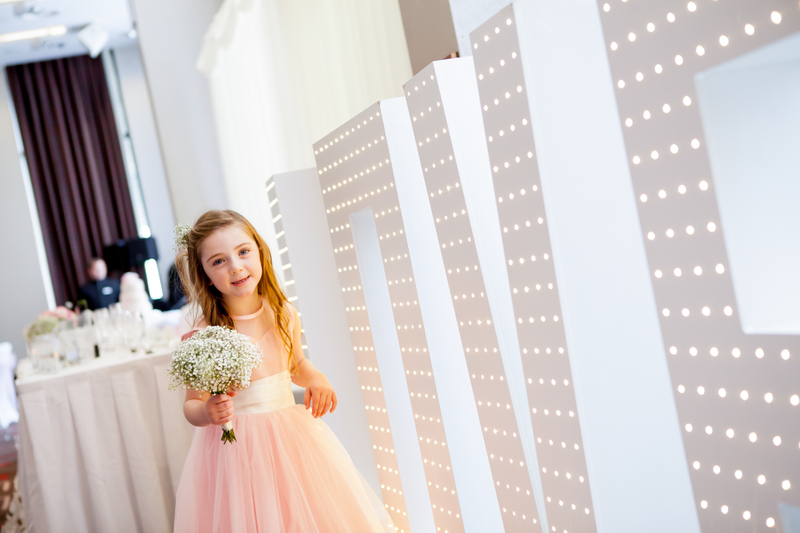 Marcus set the company up in 2005 and has established Big Entertainments as one of the main wedding suppliers to many of the main chain hotels across the northwest. Kellie Routledge – Director. Kellie formed the company alongside Marcus in 2005. 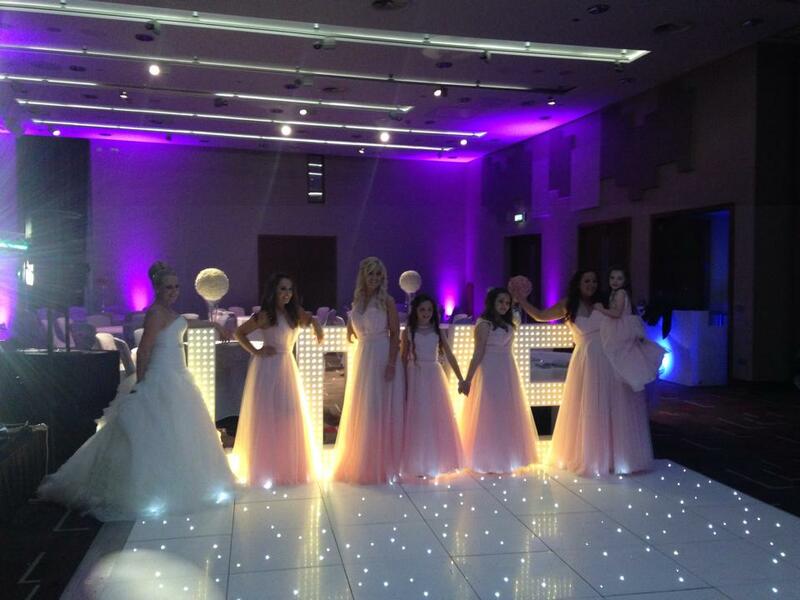 Kellie has an extensive background in events and management and has arranged over 3000 wedding. Nathan Turner – Sales & Marketing. Joanna Brown – Accounts & Administration. Ann Griffiths – Financial Controller. Shelly Griffiths- Venue Dresser / Florist. Mark Bucham - Operations Manager. 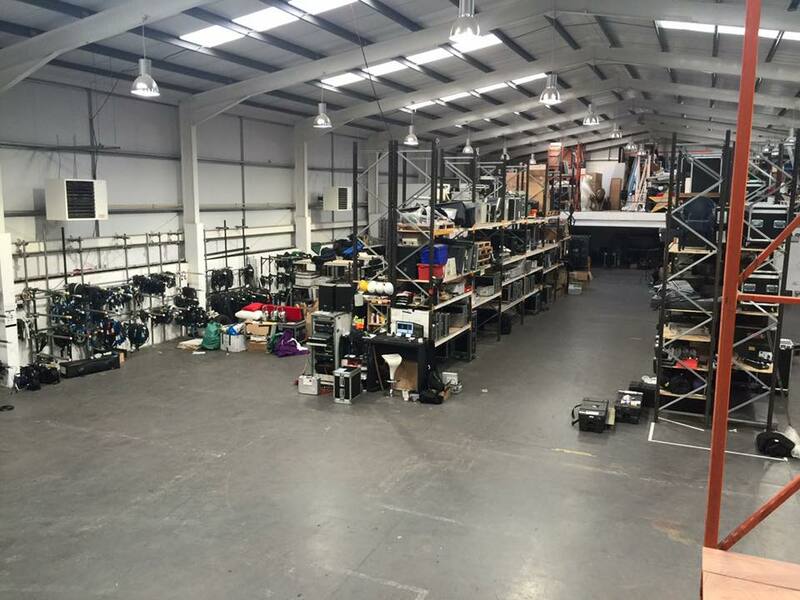 Big Entertainments is a thriving family business operating from 18,000sqft of warehouse and office space – providing an extensive product range and technical expertise. 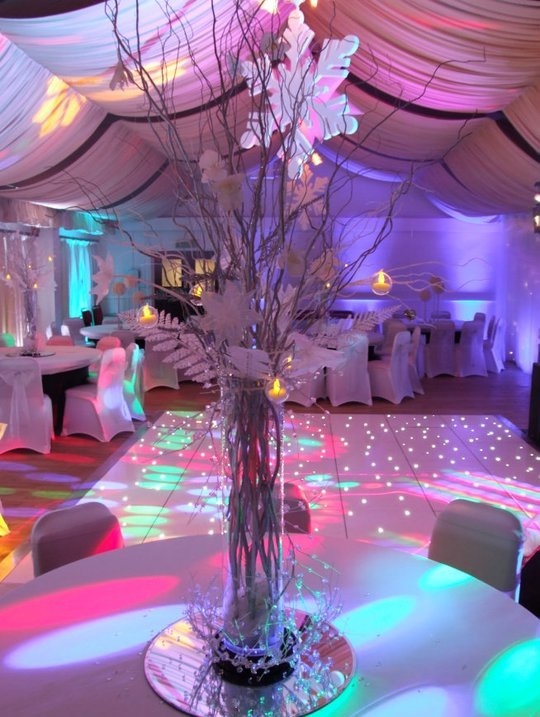 In addition the company provides an in-house showroom, meeting rooms & Warehouse storing over 300 wedding products, ranging from table centers, venue dressing, decor, photo-booths, dance-floors, themed props and an extensive range of stage sound & lighting. 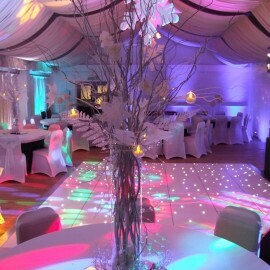 What does the dance floor hire include? 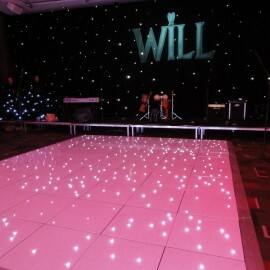 Our dance floors can make your event look truly glamorous. 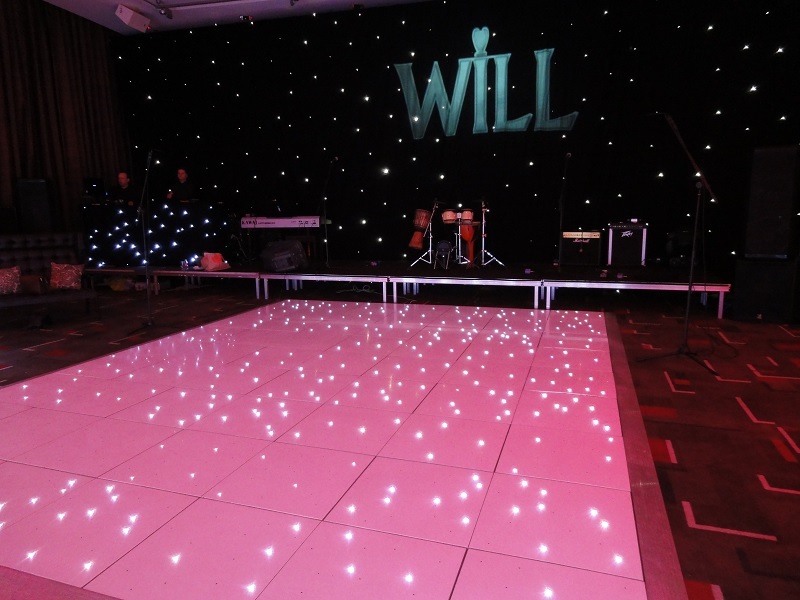 You can choose from a standard dance floor or a special twinkly one made up of hundreds of small, low-voltage LED lights that are installed into the tiles. 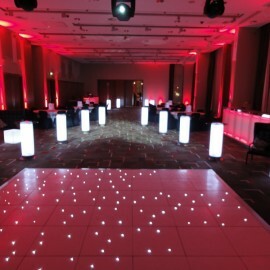 It will illuminate the dance floor to create the illusion that you are dancing on the stars. 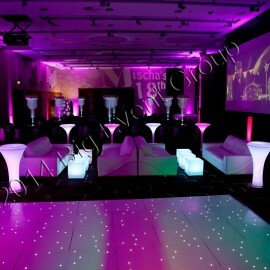 They will twinkle and glow in a variety of ways to complement the music at your event. 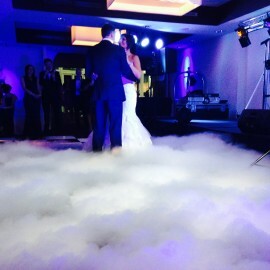 The dance floors can also come with a unique, awe-inspiring Dancing On Clouds experience as an upgrade. 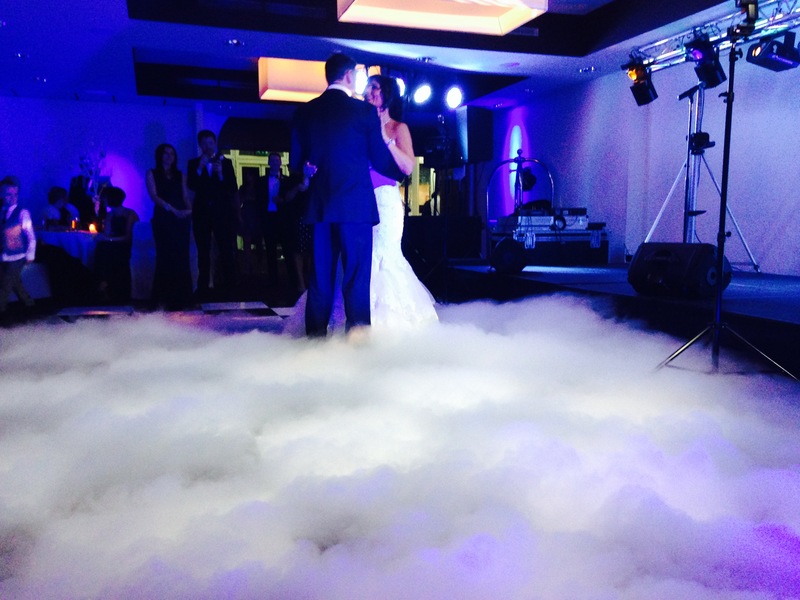 It employs dry ice to create a magical cloud that hugs the dance floor at your chosen moments. The effect makes you look like you are dancing on air. 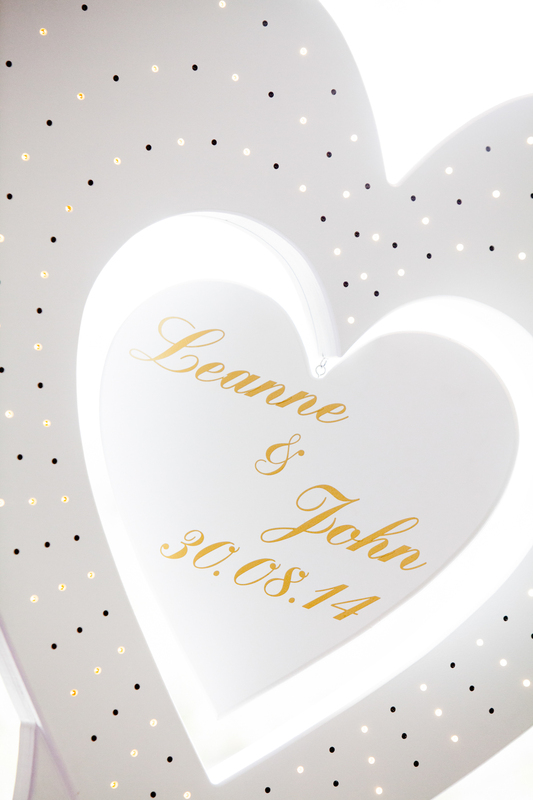 Perfect for your first dance as a married couple, but also great for any time during your party, it is a stunning addition to dance floor that your guests will remember. 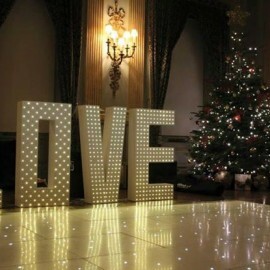 Stunning 5ft large illuminated LOVE sign. 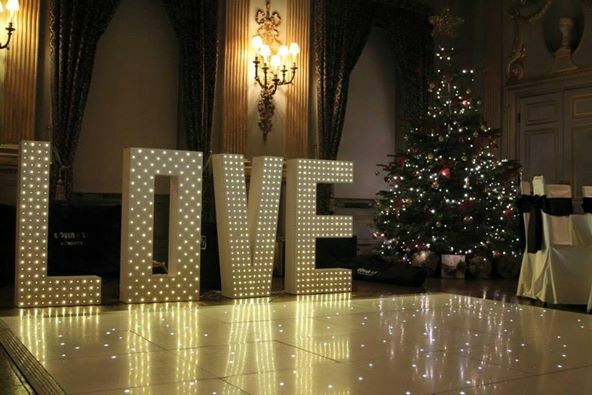 Featured 5ft illuminated LOVE sign available adding a grand feature to your wedding day our LOVE sign has over 3000 LED twinkly lights. 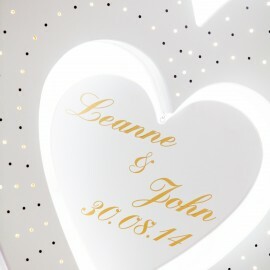 A stunning addition to for your dance floor. 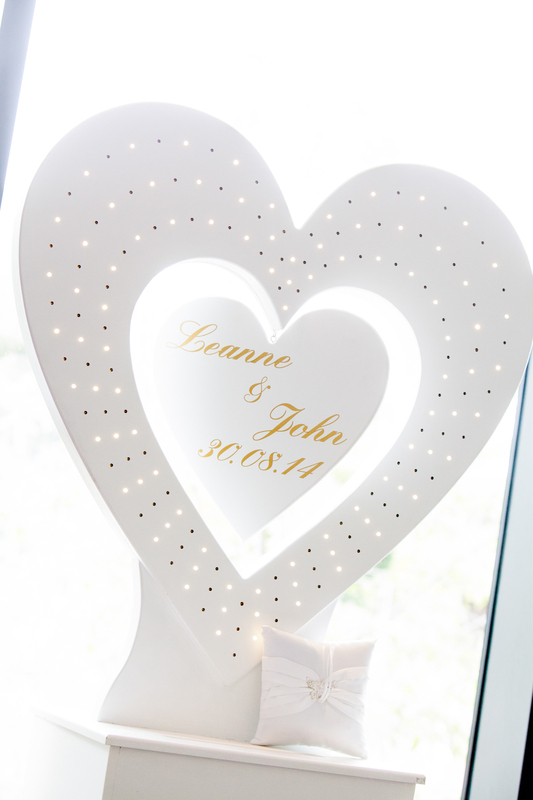 LED featured heart post pox with facility for you guests to leave there cards in your customised featured postbox, our heart post box comes with your names customised on a large 9inc heart shaped middle feature. 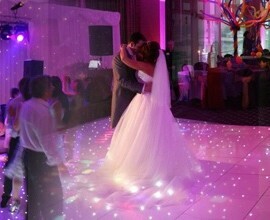 Dance floors can also have a customised design projected onto them for a small upgrade fee. 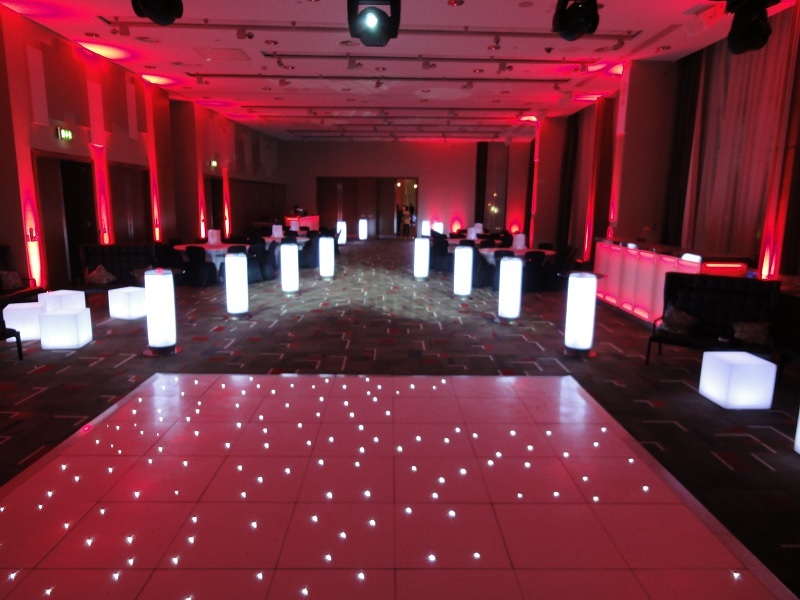 The choice of image is up to those who hire the dance floor – it can be a customised logo for a corporate event or the name of the couple getting married at a wedding. 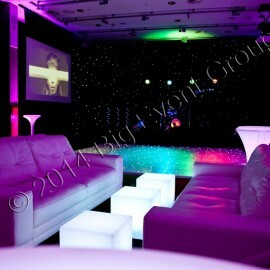 The effect will provide an added wow factor to your gathering. 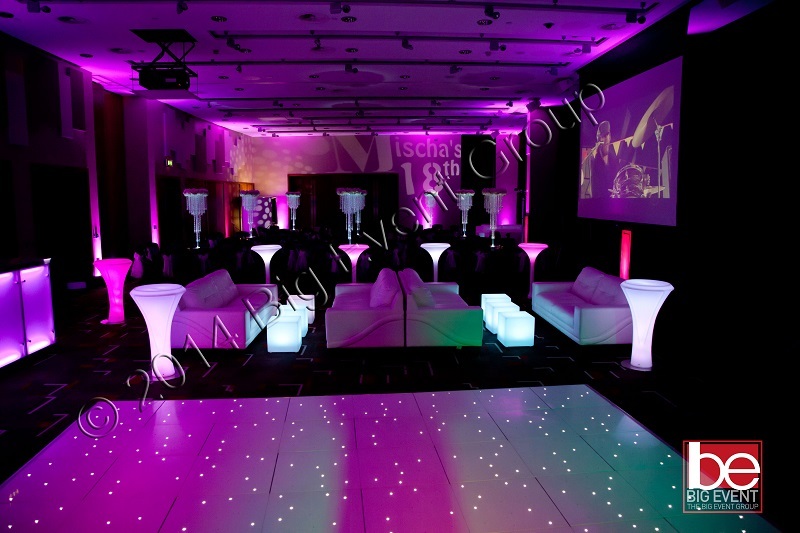 It is achieved by using a specially designed light fixture and a special disc known as a gobo which installed onto the fixture. This will be able to show the image wherever light is projected. 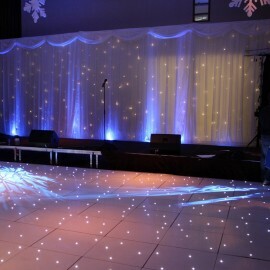 The price of the dance floor is dependent on the location where your event is taking place and the size you will require. 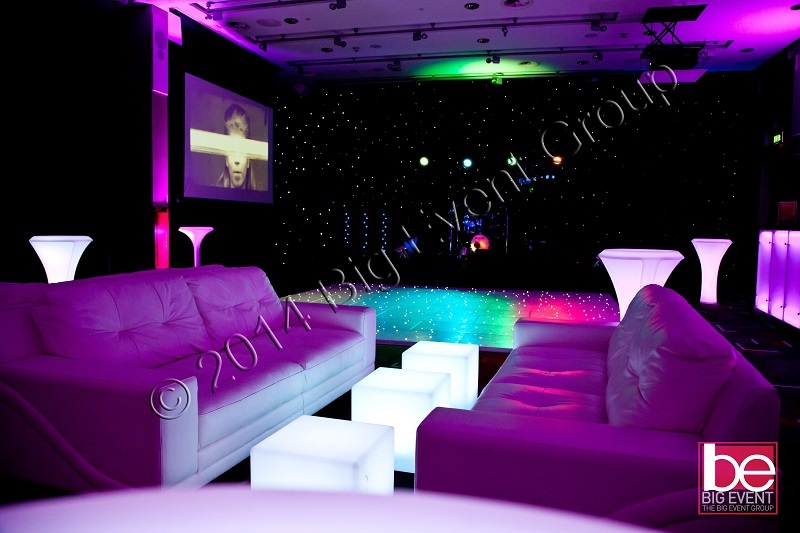 The floor itself is included in the price, as is the installation and set-up at your venue. 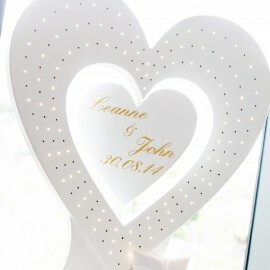 The aforementioned Dancing On Clouds effect and image projection also our large illuminated LOVE sign and LED featured heart post pox will come at a small additional fee unless purchased as a combo package. Enquire now for further details.